All transactions are safe and secure with a reliable history in online purchasing behind each of our associates. Buy the It's Always Sunny in Philadelphia Kitten Mittens t-shirt to own It's Always Sunny in Philadelphia clothing and merchandise. This It's Always Sunny in Philadelphia t-shirt is sure to get some laughs. Does your cat make too much noise? If so, you need to get your little pal kitten mittens. The little paw silencers are promoted on the show by Charlie Kelly. Apparently he has had a lifelong struggle with cats. This tee is the next best thing to actually seeing them on a cat. 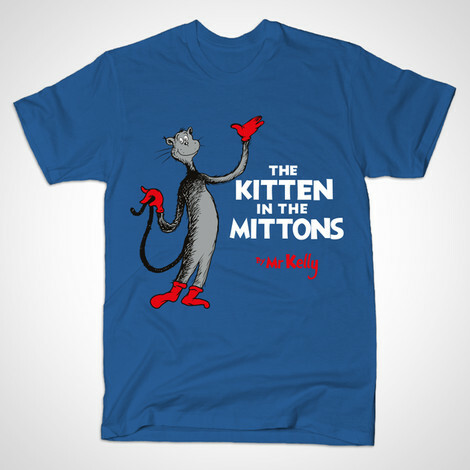 The Dr. Seuss inspired design features the Charlie Kelly quote, as well as a furry feline wearing a pair of kitten mittens. For some reason, cats don't seem to be as enthused. In addition to the It's Always Sunny in Philadelphia Kitten Mittens tee above, browse the It's Always Sunny in Philadelphia Clothing Gallery for more apparel like men's and women's clothes, kids shirts or hoodies.